HydroMassage 350 Series offers deep-tissue massage strength trusted by doctors and patients for over 23 years. Need a chance to just get some alone time? Most places offer Hydrotherapy but not in private treatement rooms. We have the strongest unit for my patients that money can buy. Hydromassage is a type of massage based on the therapeutic use of warm water. The essence of hydromassage is applying massage techniques to the human body (thermally, mechanically, or chemically) through the water. Dry Hydromassage helps to relax muscles, increase blood circulation, and relieve muscular pain and tension. This therapy has been touted by the Walter Reed Medical Team for Veterans rehabilitation. HydroMassage is an unattended private room massage experience that will give you the opportunity to get a 15 minute massage whenever you need it. You can enjoy HydroMassage before or after work or during your lunch break…anytime! Bring your favorite music or listen to ours! Fully clothed treatment! 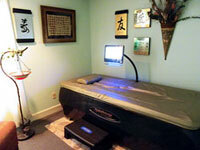 HydroMassage is the easiest way to provide the benefits of massage without an actual massage therapist present. Affordable care that is the equivalent of a 45 minute deep tissue massage session. Temporary pain relief and venous circulation. 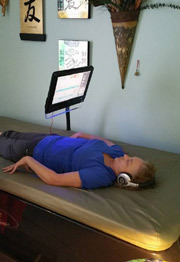 Relaxes patients for spinal manipulation. Increases range of motion as it runs the same length as your postural muscles. Assists is lowering blood pressure. Creates awareness of the body with the safety of a private room. Reduces anxiety levels and lowers stress syndromes. Gives a sense of well-being. Improves the ability to monitor stress signals. Gives a feeling of peace of mind. Provides with a relaxed state of mental alertness. Helps treat athletic or job related injuries. And many more diseases and ailments. Call Fairfax Chiropractic today for more information on how Hydromassage can help you. Flexible Spending qualified.